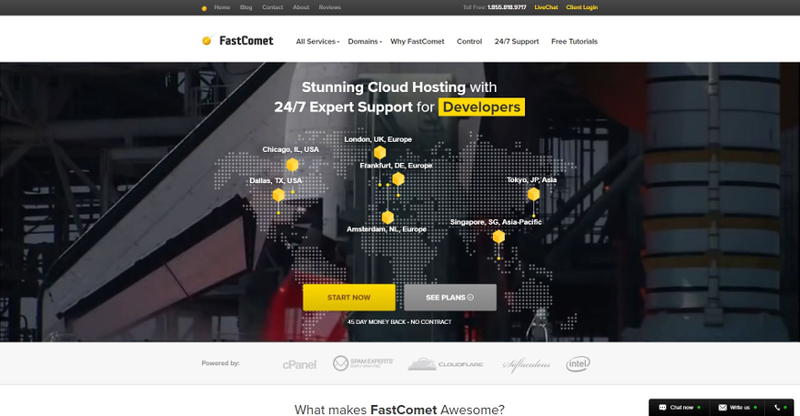 FastComet was founded in 2013, with a team experienced in the web hosting industry. They aimed for creating a finely crafted PaaS (Platform as a Service). With high standards for customer satisfaction and technical excellence, they are one of the most accessible and affordable partners on the web hosting market. If you want to start your website at FastComet you can start with the StartSmart plan for $2,95/month. This plan includes cPanel, Softaculous, daily backups, free website transfer, unlimited databeses and sub-domains. You can also enjoy free domain for life with the plan, a free drag&drop SiteBuilder and the help of a 1-click app autoinstaller. If you want more power you can upgrade up to the SpeedUp plan for $12,95/month (you can go down to $9,95 if you sign for the longest period available). You can get (addition to the StartSmart plan’s features) triple CPU and RAM amount, unlimited addon domains, Google PageSpeed, 3 free website transfers, free private DNS and many more. With the SpeedUp plan you can also enjoy the features of the RocketBooster, such as Varnish Cache & WAF, 3 times less clients per server, LiteSpeed LSAPI, Memcached and Patchman security. Overall the prices are really good, and comes with a lot of features. If you want the freedom in your hosting, you must check out the VPS servers of the provider. All of their VPS plans are cloud based. You can start from the Cloud1 plan, with a single-core CPU with 1 GB RAM and 24 GB SSD storage for 59,95/month. If you want to get more power out you can upgrade up to Cloud 4 with a hexa-core CPU with 8 GB RAM and 192 GB of SSD storage for $139,95/month. All of FastComet’s VPS plans come with free cPanel and Softaculous, free SSH access, free domain name and free website transfer. FastComet guarantees the server resources you pay for, so you will not share any of those. You can enjoy free daily and weekly backups with their VPS services and your server will be protected from brute-force attacks, denial of service, exploits and malware. Your server will also be monitored 24/7/365. One thing to note is that if you plan on using one of their non US based servers you need to pay an extra $10. If you want the most power for you hosting needs you can choose from the four available plans for dedicated servers at FastComet. All of their servers are running on freshly updated Intel’s Xeon E5-2680 V3. With the starting plan you get a quad core CPU configuration with 8 GB RAM and 96 GB SSD storage for $139/month. If you want more performance you can upgrade up to the DS4 plan with a 12 core CPU, with 48 GB RAM and 769 GB SSD storage for $419/month. All of FastComet’s dedicated servers are featuring free cPanel and Softaculous, free SSH access, free website setup and free website transfer. You can also enjoy guaranteed resources, SSD file storage (including databases), optimized server setup and more. Their team protects your server against attacks. This includes a network firewall, web application firewall, brute-force protection and exploits and malware protection. Free daily and weekly backups are available with free backup restore to help you get to a previous state if needed. The servers are managed 24/7/365 with under 10 minute response time from the support. They send notifications if your server is reaching the limit of its resources and advise you on how to optimize your server. FastComet’s data centers are located at Chicago, Dallas, London, Frankfurt, Amsterdam, Frankfurt, Singapore and Tokyo. The good geographical coverage allows your users to access your content fast. The data centers are protected with enterprise-level access control, constant monitoring, a complex network of security systems and high-end physical security. Their Servers and data centers are located at Chicago, IL, Dallas TX, London, Frankfurt, Amsterdam, Singapore and Tokyo. In terms of support you have a lot to choose from. If you are stuck somewhere you can use the live chat, ticket system, community forum, blog, tutorials, and email. Of course all of these are 24/7/365 accessible. Customer satisfaction is an important thing, so we looked into Twitter, and we found that it is full of praise of their services and support. In this FastComet review we found that they have plans with great features and superb support, that also comes with a 45 days money back guarantee and great geographical coverage, but using the data centers outside the U.S. costs a bit more. We are participating in FastComet’s affiliate program, but that does not affect any ranking or facts. We always give our own, honest opinion in our FastComet review. The servers outside the U.S. costs a bit more.